Well it was another lack lustre week with the coho fishing and the chinook fishing in our local waters being very difficult for the most part. The coho season has certainly not shaped up how we were hoping. 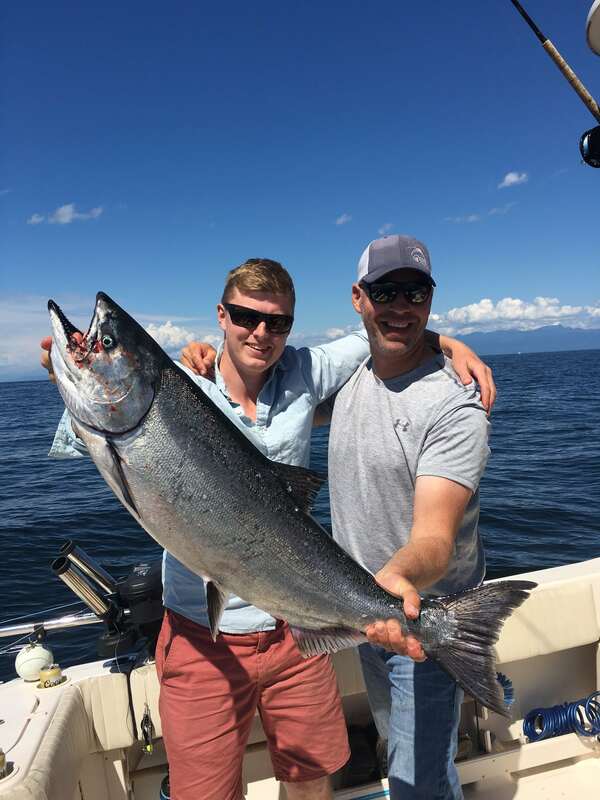 With some good early season catches of oversized fish for June and July, including lots of hatchery fish, we were assuming West Van would be good by late July and August. For the most part this has not been the case. A lot of fish definitely made it up the river during the July rain but there are still some more fish to come so lets hope things pick up in the back end of August. The fish that are around are getting picky. That means trying to get out there early in the morning before it is too sunny out. Also try using bait as the coho that have been hanging out off West Van for a long time start to turn off the white hootchies a bit this time of year but they will still bite anchovies. The fresh fish that come in will respond well to a white hootchie. 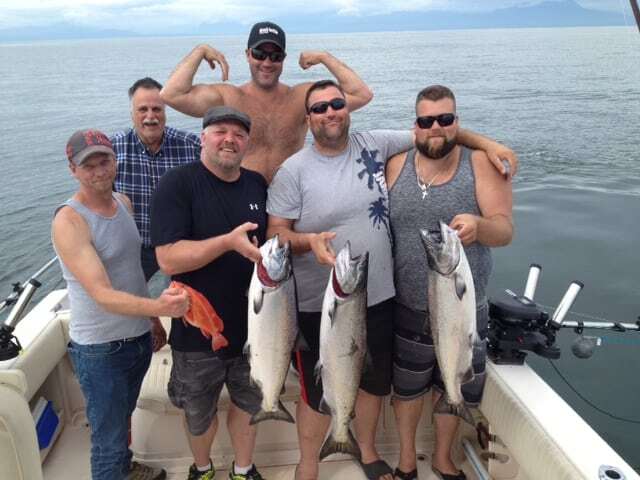 The chinook fishing has been very tough in our area as well. There have not been a lot of encounters with chinook at the Bell Buoy, T-10, and only marginal fishing at Sandheads. We definitely got spoiled last year, the fishing was on fire, so this year the slower fishing especially hurts as last years great fishing for chinook is still not to distant of a memory. Peak migration for chinook into the Fraser starts next week and lasts until the end of the month, so don’t despair, it will pick up, but don’t expect it to be anything like last year. A few hard earned fish from across the Strait. Note that they re-issued the closure for the Fraser Non-Tidal and for the Fraser Tidal and for the Fraser Mouth. This closure is because of very low sockeye numbers, it has nothing to do with chinook numbers, however, the closure states no fishing for salmon in the closed areas, so it does shut the anglers down on the Fraser who want to bar fish for chinook. In terms of saltwater fishing, these closures may affect you if you plan on fishing T-10 and the South Arm aka Sandheads. You need to read the closures and plot the lines and know where you can and can’t go. We often get asked at the store where you can and can’t fish during these closures. You really need to take the time to plot the lines on your chart plotter so you know if you are outside of the closed area. That is the best answer we can give you. It is impossible for us to tell you where you can and can’t fish in such a huge area so you need to take the time to plot the lines or draw them out on a chart. If you do that you will know if you are outside of the closed area and in doing so you can still effectively fish for chinook in these popular spots. To get the description of Area 29 and the Subareas mentioned in the above closures, click on this link Management Area Boundary Descriptions and then scroll down to Area 29 and the Subareas and you will have the co-ordinates and descriptions you need to chart it on your chart plotter or draw the lines on a chart. Take a deep breath, grab a fruit smoothy, a cup of coffee, a 6 pack of beer, or your favourite single malt, because it is going to take some time! Okay, enough of that. Time for some positive news. When the winds have allowed and our customers have booked 10 hour trips, we have found some nice chinook over around Gabriola and Nanaimo. We normally don’t fish that far this time of year so it is all a new game, but we have had some great results when the winds have allowed us to get over there. It hasn’t been easy, fishing 240 feet down with 18 pound cannonballs is no joke, but the results speak for themselves. Client Matt and guide Jason with a nice chinook from the Nanaimo area. So in closing, keep your spirits up and let’s look forward to some more Fraser chinook showing up in the coming days and take the time to be educated and plot those lines so you can fish effectively in that area. In the saltwater world things have been a challenge but any day that could turn around. We can still fish in the direction of the Fraser outside the boundary line and on any given tide we could see the first big waves of chinook hitting the bell buoy. Check out Jason’s report for more details. Last but not least we have some big product news and we are running a Summer Mini Sale with some awesome deals on discontinued product. You will not want to miss out! Be sure you are up to speed with all of the recent regulations related to the Fraser. Here is a quick round up or recently announced regulations. You’ve got one week left to register! Do not miss out on this amazing tournament. For only $300 per registered angler you can spend the weekend on the water and land the winning fish! 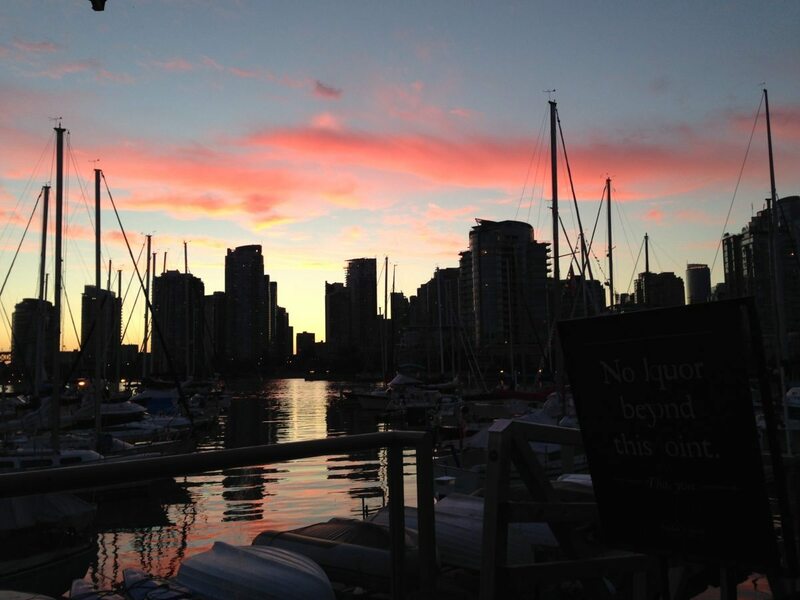 Aside from the chance at $15,000 for reeling in the winning fish registration includes a hot fisherman’s breakfast each morning, moorage at Pier 73 Marina and Yacht Club, Saturday evening dinner and an afternoon BBQ awards ceremony on Sunday. All that plus some amazing prizes and auction items! Check out all of the details for this year’s tournament and download your registration form here!